Science is complex. It’s understandable that scientists will develop a jargon, a specialized language of their discoveries. But this forms a frustrating and completely unnecessary barrier to public understanding. In this series of posts I explain fundamental processes in molecular biology, the better to breach that jargon-wall. A cell must replicate its DNA before it divides. The structure of DNA, famously discovered by Watson and Crick, makes it a perfect molecule for encoding our genetic information. The letters of our genetic code comprise four different nucleotide molecules; adenine, thymine, cytosine and guanine. These are frequently abbreviated to A, T, C, and G. A DNA molecule is made up of two strands of polynucleotides (i.e. long strands of A, T, C, and G), coiled around each other to form the famous “double helix” structure. Just as in film photography, the negative of a photograph is the same image with its colors reversed, so too in DNA. In its sequence of nucleotide letters, each DNA strand is a “photo-negative” mirror of the other. The “A” on one strand always pairs with a “T” on the other, while “G” always pairs with “C”; a sequence like “GATTACA” on one strand is mirrored as “CTAATGT” on the other, each letter binding to its partner, zipping the strands together into a single 2-metre-long molecule. This pairing, a pairing that arises straightforwardly from the laws of Chemistry, is the key to the DNA molecule’s marvelous ability to copy itself. For each strand when unzipped from its partner grows back its missing complement, automatically creating two identical DNA molecules where once was but one. This directionality matters because DNA replication takes place via an enzyme known as DNA polymerase. Molecules of this enzyme start at one end of a DNA double helix and ‘walk’ along the double strand, one enzyme molecule per strand, faithfully copying our genetic code letter by letter. But the biochemical versatility of DNA polymerase is strictly limited; the molecule can construct a new strand in only one direction; the 5′ to 3′ direction. Therefore, although DNA replication is straightforward for one of the DNA strands (the 5′ to 3′ strand), the process duplicating the other strand (the 3′ to 5′ strand) is more complicated. While the 5’ to 3’ strand is replicated in one continuous string, the 3’ to 5’ strand is duplicated in segments. Replication begins with the unwinding of a section of the DNA double helix by an enzyme known as DNA Helicase*. Helicase acts like a zip slider, unzipping a section of the DNA double helix, allowing the rest of the DNA replication enzymes to access this starting site, then moves on down the double helix, splitting another length of the strands apart. Meanwhile DNA polymerases move along the now-unzipped strands, recreating the strands’ absent partners. The process that builds a new 3’-5’ strand is particularly contorted. An enzyme known as primase reads the template DNA and initiates the synthesis of very short complementary RNA fragments. DNA polymerase uses these RNA fragments as molds to synthesize fragments of DNA in between the RNA fragments. The RNA fragments are then removed and the fragments of DNA are joined together by another enzyme, DNA ligase. 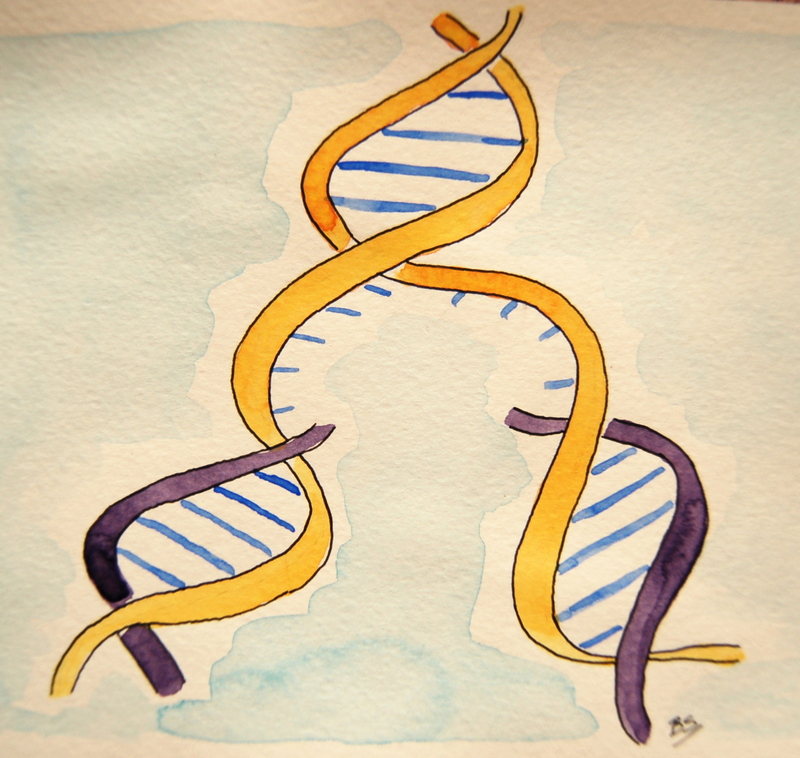 Eventually DNA replication stops because the DNA cannot be unwound anymore; the remaining DNA is too tightly twisted. In order to release this tension to allow DNA replication to proceed, enzymes known as DNA topoisomerases cut the DNA periodically to release the tension and then splice it back together. DNA replication is a carefully regulated process that allows our genetic material to be copied each time a cell divides. Many different enzymes coordinate their functions in order to carry out this process in a seamless manner. DNA polymerase is not error free, and any errors that are introduced are dealt with through elaborate DNA repair pathways whose story is fascinating and the pivot of advanced medical therapies — but that is another article, another day. This is first in the Molecular Biology 101 series. The next article is on gene transcription.